Just bought a jetski or looking for a better deal on insurance? Protect it today by using our comparison service to find a policy that suits you at a price that is bound to please. Will you be using your jetski for competitions? Some insurance policies reduce claims if you are racing. Some will include cover for race entry fees if adverse weather causes cancellation. Do you want cover for your safety equipment? Check the limits of cover that any potential policy has for personal belongings and kit. 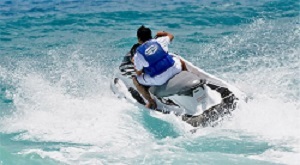 European cover is often, but not always a feature of JetSki insurance. If you think you might need cover in Europe, it will almost always be cheaper to find a policy offering it from the start rather than adding it part way through the year, when policy amendment fees will apply. How old is your JetSki? Some JetSki insurance policies have age restrictions on the boats they cover. If yours has been well lovedthen make sure it will be covered by your chosen policy. Ready to get a quote - just click the button above and your search will be underway in minutes. But if you have any queries please feel free to call us. We have people to help on hand with any questions you may have. Just call us on 0800 520 0699 option 3. We'll be happy to help. We approach insurers either directly or through brokers. This service is operated on our behalf by Seopa Limited.